The calendar read Spring but the garden was having none of it. Warm December breezes seduced Forsythia, Spring’s herald, into untimely bloom — which was then zapped by Mother Nature’s icy hand. So now the remaining buds, exercising extreme caution, were shut tight. Thankfully, daffodils and the deliciously fragrant flowering shrubs Pieris japonica and Sarcococca hookeriana humilis stepped up and saved the day. Still, it’s not all “raindrops on roses.” Because of climate change, we have to contend with a dramatic increase of pollen in the air. The National Institute of Environmental Health Services recommends that allergy sufferers remain indoors from 5 a.m. – 10 a.m. when the pollen count is highest. Regrettably, that’s Prime Time for work in the garden — especially in hot weather. But we cope and move on. British author Iris Murdoch got it right: “One of the secrets of a happy life,” she said, “is continuous small treats.” A wonderful small Spring treat is Lily of the Valley (Convallaria majalis). I’ve treasured this vigorous, rhizomatous, perennial groundcover for over forty-five years. I can’t imagine my garden without it. 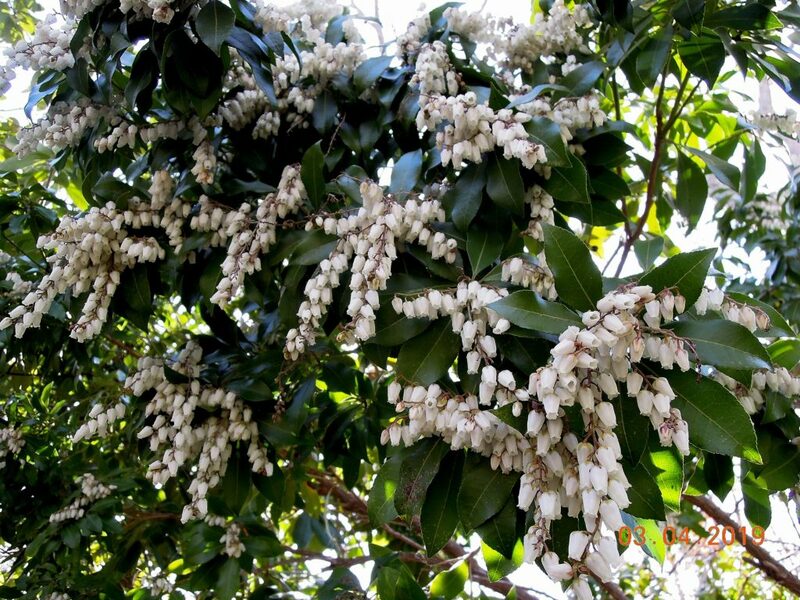 In May the plant produces enchanting racemes of very fragrant, tiny, snowy-white bells. 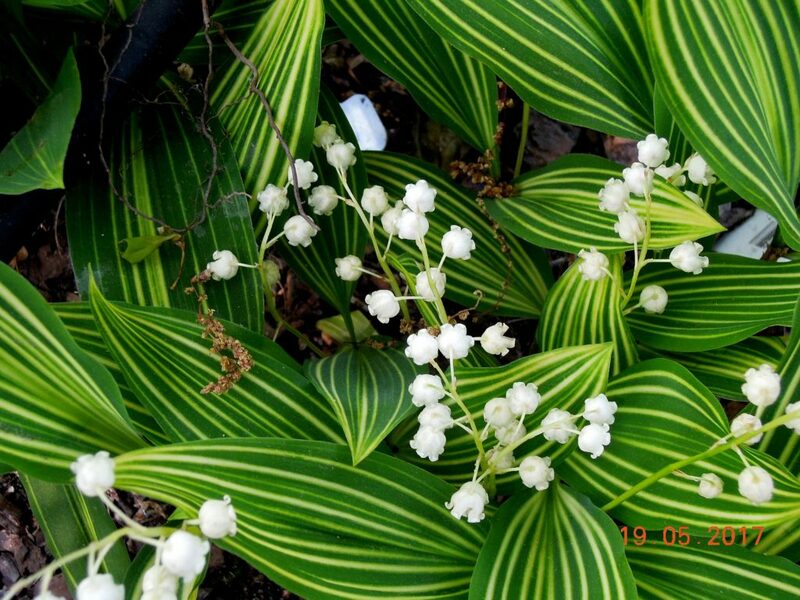 A striking variegated-leafed variety, Convallaria majalis ‘Albostriata’, is also available. Photos below. 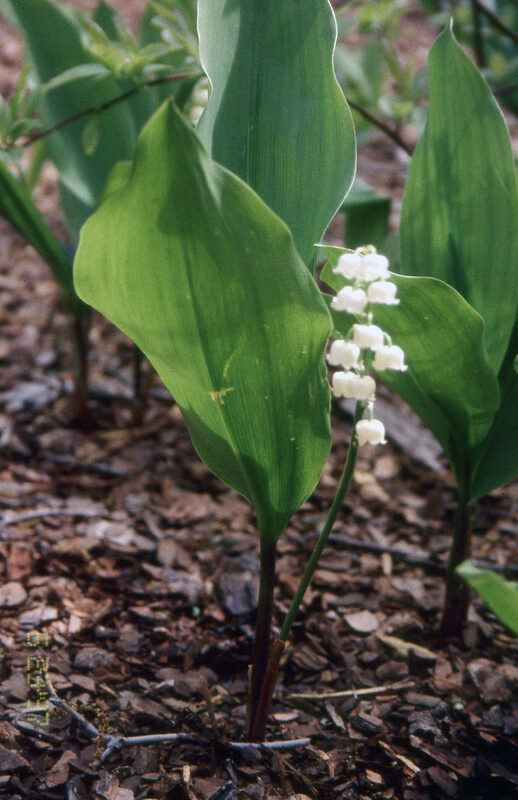 Lily of the Valley thrives in moist, well-drained, acid soil in shade. 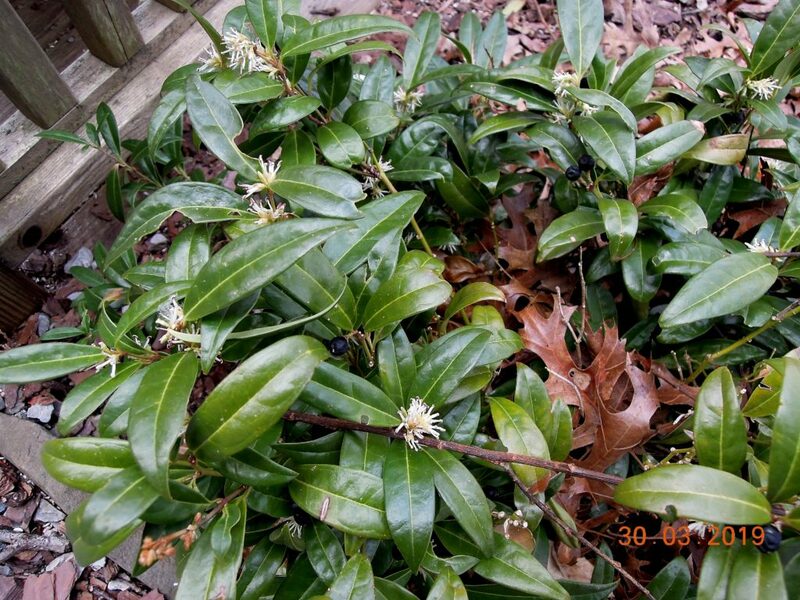 All parts of the easy-care plant are poisonous and deer don’t mess with it. But not everyone is a fan. One of our best garden writers, Alan Lacy, had this to say: “I once planted lily-of-the-valley in a far corner of my garden, for what garden should be without its graceful nodding bells in late spring? But I now have a sheet of it fifteen feet in every direction that must be confined by ripping out great numbers of plants each year. I should have known better.” In a Green Shade (Houghton Mifflin Co. 2000). Another outstanding American garden writer/author, Elisabeth Sheldon, was even more emphatic: “Who warns people about lily of the valley?” she said. “[It] sends its troops forward underground — under rocks, pathways, and other plants. I’m pretty sure it wouldn’t be stopped by a cement sidewalk, so if you want to grow anything other than lily of the valley in your shade garden, you should never let it get started, no matter how much you love its scent.” A Proper Garden (Stackpole Books 1989). Lacy and Sheldon: Accomplished, hands-on gardeners and a joy to read. 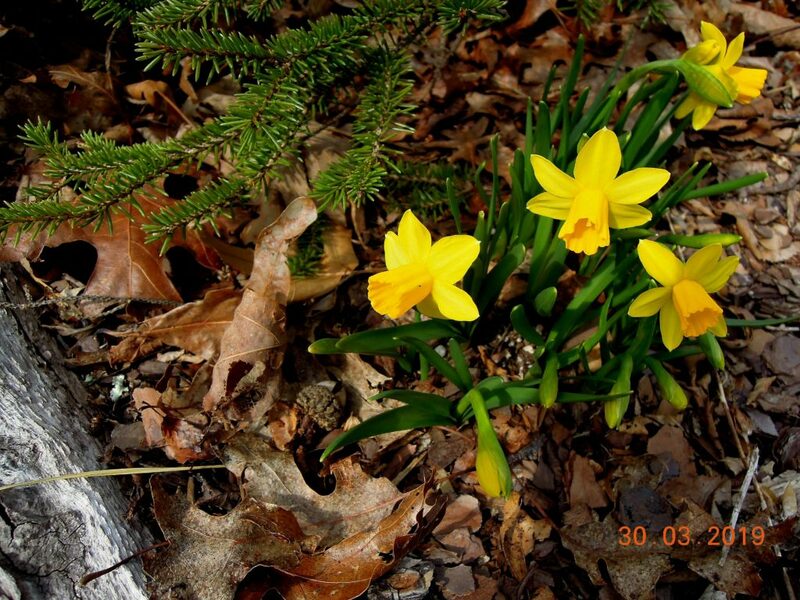 This entry was posted on April 5, 2019, in Autumn Fruit and Color, Flowering Shrubs, Fragrant Plants, Garden Books, Hot Tips, Organic Gardening, Shade Gardening, The Fragrant Garden, Trees and Shrubs. Bookmark the permalink.